Welcome to another round of Movie Gallery’s weekly giveaway contest! Last week we had a lot of fun with the Lost Boys Giveaway, and the Michael & David action figures are now on their way to a new home. 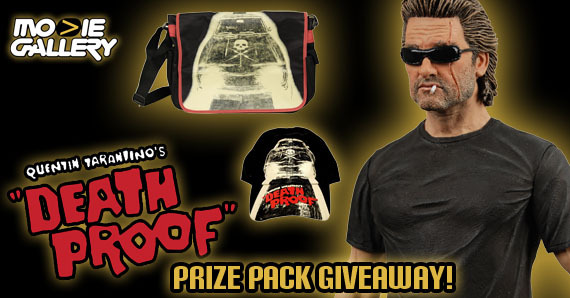 This week we’re giving away a cool pack of prizes from the film Death Proof! The 2007 action-thriller-slasher film was written and directed by Quentin Tarantino as part of a double feature release with Robert Rodriguez titled Grindhouse. The film centers on a psychopathic stunt man who stalks young women before murdering them in staged car accidents using his “death-proof” stunt car. Read on to learn how you can win an action figure, hat, and messenger bag featuring artwork from the film! This 7” scale Stuntman Mike figure comes from the “Death Proof” segment of Quentin Tarantino’s Grindhouse double-feature movie. A stuntman by day, the character played by Kurt Russell hides a “killer” personality behind his dark sunglasses. Includes alternate head. 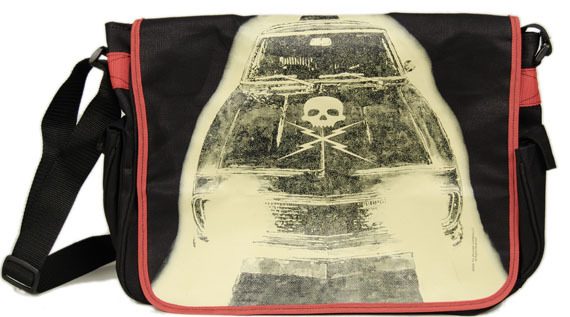 Gears on the go need this incredibly sturdy messenger bag from Death Proof! The front velcro flap features Stuntman Mike’s custom ’69 Charger. The inside front pouch features an embroidered Death Proof film logo. It’s got plenty of room to stow your stuff, with a 16x12x5″ main compartment and two side cargo pockets! Made of machine washable 100% cotton canvas. 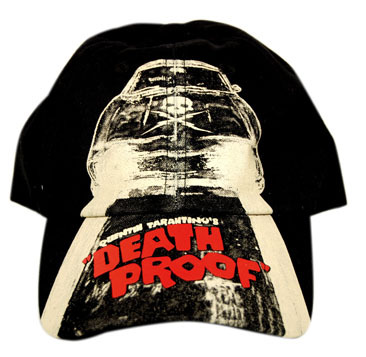 This cool baseball cap features the Death Proof logo and ’69 Charger graphic. One size fits all. This entry was posted in Contests & Giveaways, The MG Blog and tagged Action Figure, Death Proof, giveaways, grindhouse, hat, Messenger Bag, Quentin Tarantino by mgadmin. Bookmark the permalink.